Here is a look at my 2014 goals and progress. My progress from a month ago is in green. I feel like I haven't made much progress, though I know things keep moving along. 7. Post more information about Japanese card shops: [I should start planning how to do this...] Still at 0%. 8. Post about NPB awards: [nothing yet, but once I finish my backlog of posts I'll go after this.] Still at 0%. Are you ready for another history lesson? Continuing my obsession of collecting baseball cards without any baseball on them, here are some Historical Moments cards from Upper Deck's 2009 A Piece of History set. There are 50 cards in this subset, numbered as part of the base set. The history mostly spans the past 100 or so years. I think this is the first nighttime picture I've seen of the Hollywood sign as Hollywoodland. I've biked across the Golden Gate Bridge. The first inhaled anesthetic used was by Dr. Long, who has both a museum and hospital devoted to his name and his work in Georgia. Dr. Morton, of Boston, was the first to publicly demonstrate inhaled anesthetics. I haven't seen Mount Rushmore yet. I'm not sure if or when I ever will. I guess the last time the Cubs won the World Series, over 100 years ago, is a historical moment. The last Chicago Cubs World Series trophy is an antique, after all. I have finally finished this set after four years of building it; I also finished my never-really-started 2008 Topps Heritage News Flashbacks set in one go. 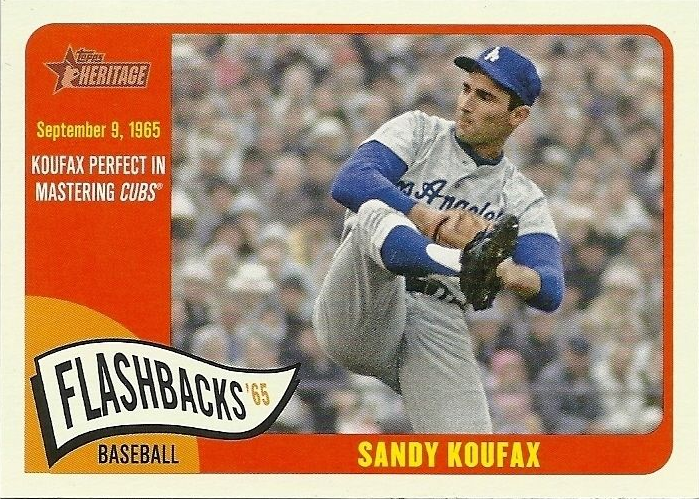 These cards all look at 1959, and the design borrows from the 1959 Topps set. How cool would it have been to have shown Castro in a baseball uniform instead? Hawaii. There's a lot I'd like to see in the world, and Hawaii is on that list. But despite its natural beauty, the 50th State is quite low on my list. The penguin says hello. I'm saying goodbye. I'm quite glad to have these two sets finished! In the past three months, I've really worked hard to knock down my want lists. I've succeeded in finishing off several sets, including some Team USA team sets from recent Bowman releases. Bowman Platinum: a set I could do without. 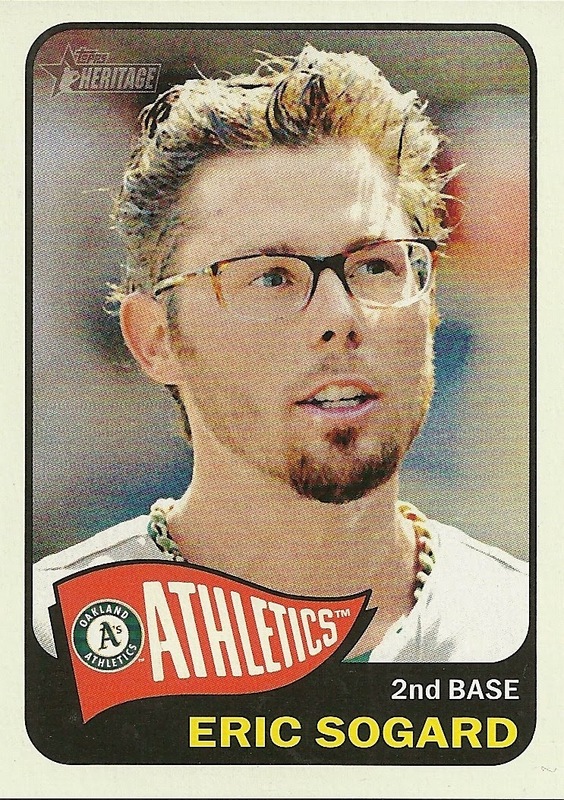 Seriously, this is everything I dislike about baseball cards. 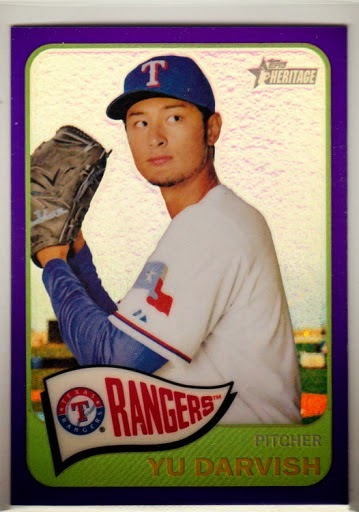 Boring use of foil background, boring design, players nobody's heard of on cardboard only because they might become major leaguers at some point... I do like the Team USA cards, though. The 1993 Stadium Club Murphy Dome set has been quite elusive thanks to the inclusion of a certain Yankee legend. But I've managed to gather all the singles I need for the Team USA team set. I still need the Dome set itself too. I feel like Bowman put Team USA cards in every set it issued in 2011. These cards don't have an awesome design, but at least there isn't any foil to make for a poor scan. Chris Okey needs a hat that fits him. At least Platinum used action images; the 1993 Stadium Club Dome card used what must be an actual game image. 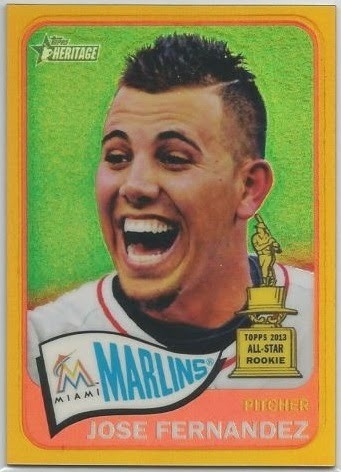 I remember when '92 Bowman came out. The foil cards were pretty cool back then, and even today they are just as nice. By my count there are 47 in the set, out of 705 cards, or one in 15 cards in the set. Since they were inserted 1 per 15-card pack, they aren't really short-printed, but they seem to carry a small premium sometimes. Anyway, I just finished my '92 Team USA set. The only Upper Deck cards from Team USA sets in my order were these National Pride inserts. I have most (perhaps all, but I think I'm missing something) of the actual Team USA sets Upper Deck produced. I've fallen behind the past two years. 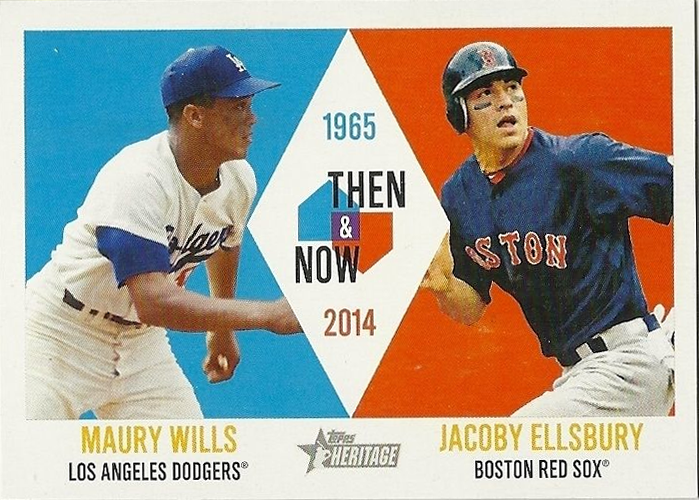 2014 Topps Heritage Review: Close, but no cigar. One egg short of a dozen. One card short of a full deck. 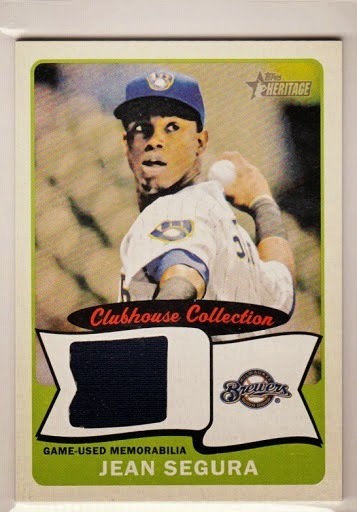 I'm not crazy about Topps Heritage. I recognize its appeal, though. A large percentage - perhaps a majority - of series collectors were alive and probably collecting as children during the Golden Age of baseball. The designs bring back memories of when life for them was simpler. Generally, the release is geared towards set builders, with reproductions of poses, errors, and other nuances of the original set. And many of the designs from this era were quite attractive, some timeless. But I don't have a connection with the 1950s and 1960s. My first packs as a child collector were bought in 1989. And, as I seem to mention every year, the designs are great but purposely making the photos grainy to match the originals is just irritating. I wish the Heritage sets for the painted sets were, well, painted. So I don't collect the base set. Besides, I have the flagship issue and a few other throwbacks to chase every year. This post isn't about Heritage hate... not exactly. I don't think poorly of anyone who collects the set; it's just not my cup of tea. It's one of the releases for which I enjoy seeing the cards themselves and gathering singles for my type collection. 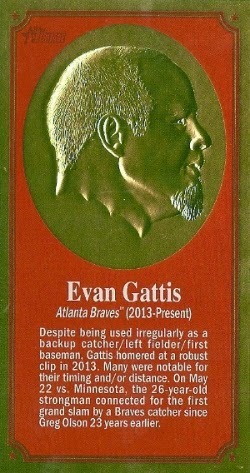 The base cards this year are styled after 1965 Topps. 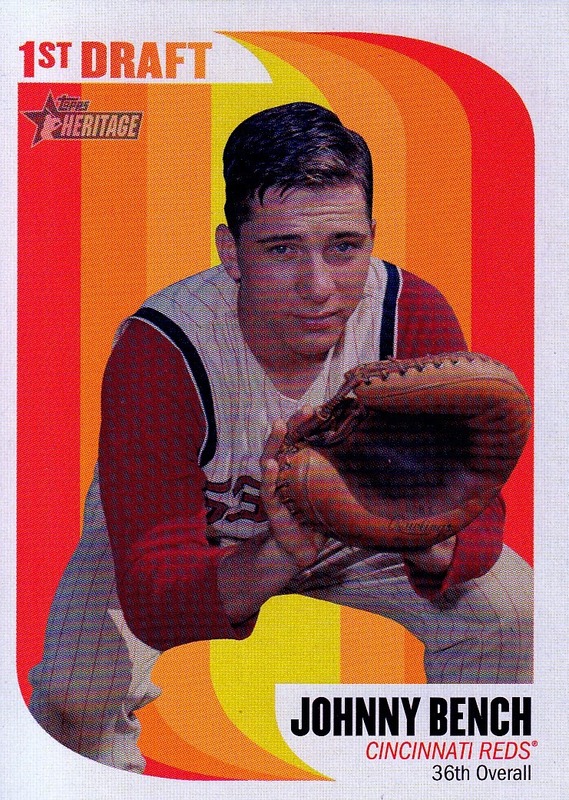 I personally consider this to be the best design Topps used in the 1960s. The card backs are fun with a handwritten-style font and cartoon, as per the original. 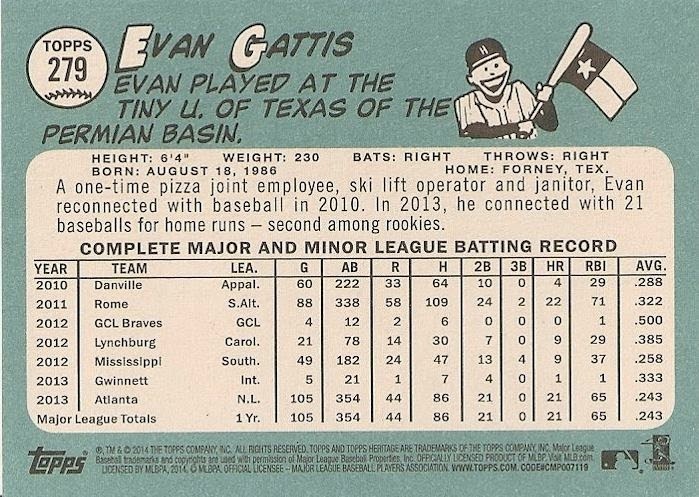 Gattis' card has extra space to mention that he had several prior jobs. I guess that's pretty rare these days, as most MLB roster members have probably never had a real job other than part-time work in high school... if that. There are 500 cards in the base set; the last 75 are short prints. Four variation styles can be found as short prints for some cards: error replications (6 cards known), throwback uniforms (20 cards), action images (25 cards), and team logo variations (25 cards). Additionally, 25 cards have a blue-border parallel found only at WalMart, and 25 cards have a red-border parallel sold exclusively at Target. It appears that there is no overlap in those two checklists, but I think all 50 red/blue border cards are also found in the Chrome and Mini parallel sets. All cards have a black-back parallel, which seem to be pretty rare. These replace the blue shading with a black (grey) shading. 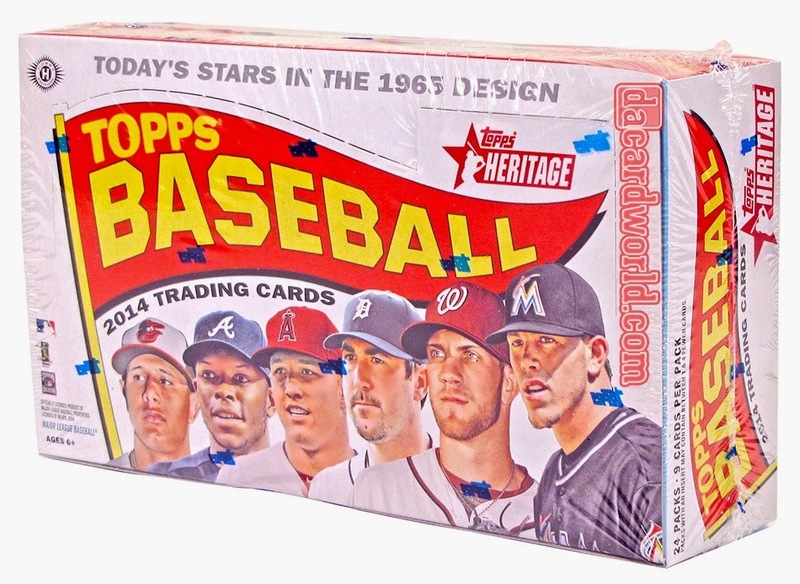 Topps Heritage has a few insert sets that come back from year to year. They borrow design elements from the base set design, which sometimes works and sometimes doesn't. Two of those are the Baseball Flashbacks and News Flashbacks sets. Each set has 10 cards. There is a 10-card Baseball Flashbacks relic autograph set, with each card serial-numbered to 10. A look back at 1965 is an interesting history lesson - both in baseball and pop culture. Two other annual offerings in this year's Heritage set are New Age Performers, a 20-card set, and Then & Now, a 10-card dual-player set. 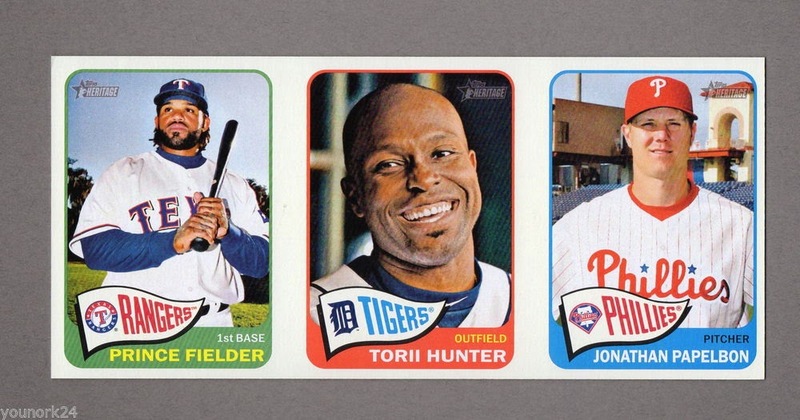 Heritage has been known to contain inserts based on inserts or other releases by Topps from the year the set is based on. 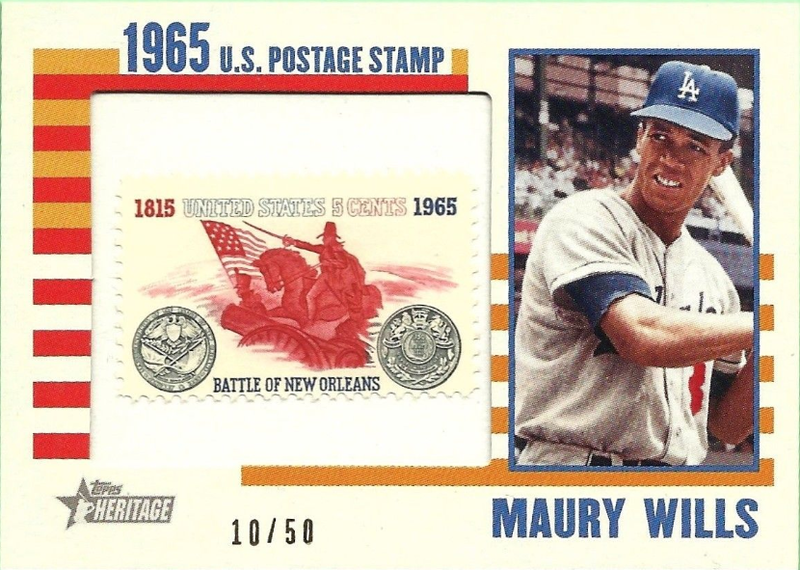 In 1965, Topps released an Embossed set, and this year's Heritage has an Embossed insert set. This is extremely rare; a single card from this 15 card set is found about 1:15,000 hobby packs. Are these 1 of 1s? How many hobby packs are there, exactly? The other pack-based insert in Heritage this year is First Draft, featuring players who were drafted in 1965's first ... well ... draft. A 20-card embossed "Giant Baseball Players" box loader set is limited to 50 copies each, with a relic set #/25; 10 cards are also found in autographed versions, #/10. The other form of box loaders are the usual advertising panels, which are strips of three cards on the front; the backs have one "traditional" card back with the other two cards' space being an advertisement for the product. There are two non-game relic card sets. One is the Framed Stamps set, a 16-card set serial numbered to 50. The other is 65 Mint, with 50 subjects in nickel (#/15), dime (#/10), quarter (#/5), and JFK half-dollar (1/1) versions. Half Dollars #/1 1:161,890, 8,094,500 packs. Either some cards don't appear in all versions (I haven't really studied the checklist a lot), or someone has a problem with math at Topps. Regardless, using this data means that the Embossed inserts, which are hobby-only and found 1:14,667 packs, are limited to somewhere between 10 and 40 copies each. I haven't looked at the odds for any other sets to see if this pans out... keep reading and I'll see what happens. A 5-card dual-relics set, numbered to 65 copies each. A 5-card triple-relics set, numbered to 25 copies each. A 5-card quad-relics set, numbered to 10 copies each. A 10-card autographed relic set, numbered to 10 copies each. A 5-card dual-relic dual-autograph set, numbered to 10 copies each. Additionally, there is a 25-card patch booklet set, all as 1-of-1 cards, found 1:65,000 packs. The odds here show an even-lower hobby pack supply, about 1.6 million packs. Real One Autographs are a big draw in Heritage, with on-card signatures from stars past and present. There are 56 subjects in this year's set, with a "Special Edition" red-ink parallel numbered to 65 copies. Additionally, there are 10 dual-autographed cards #/25, and 5 triple-autographed cards #/5, found 1:33,728 packs. And yet again, the 25 triple-autographed cards in the product indicate that there would be only about 800,000 hobby packs of Heritage. Two mega-hit sets are found in Heritage: 20 1:1 cut signature cards and 20 1:1 celebrity cut signature cards. The checklists seem to show baseball players as some of the "celebrity" subjects, including Bob Gibson, Johnny Bench, and Tommy Lasorda. There are some celebrities, like Elvis Presley and Betty White. Hobby-only inserts seem to help get an idea of the print run for a product; extrapolations about retail supply could also be made with accurate data. However, Topps' odds are all over the place. Then again, my odds are based on those posted at Cardboard Connection, and they could be combined odds for some products. an 800,000 hobby pack run for Heritage is possible, I suppose. 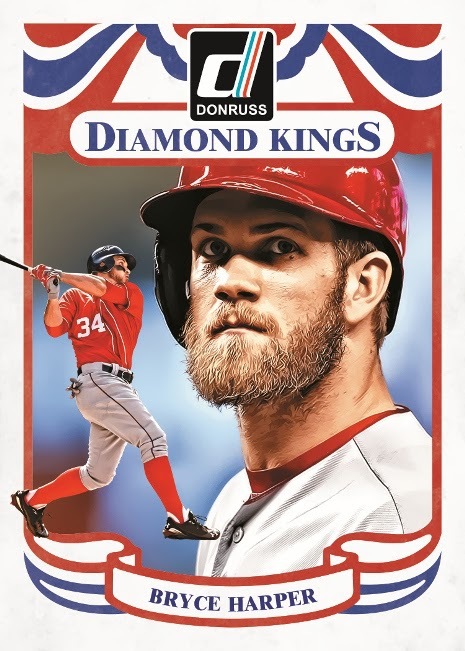 I read an article recently that Topps is seeing a decrease in orders and thus reduced its print run, and with the same-old same-old (yet straying from Heritage's successful formula) it should be no surprise. 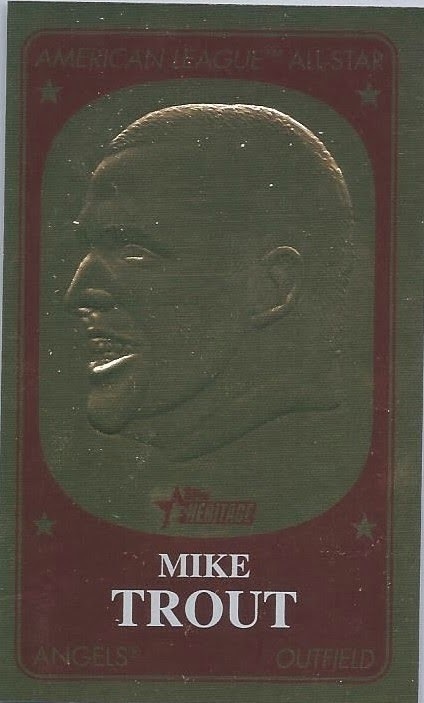 When I first saw the sell sheets for Heritage, I had at least some interest in the Embossed cards. And when I saw the first actual card image online, I wanted the insert and box loader sets. But if they're really available only in quantities of 50 or less each, there's no way I could try to build a set. 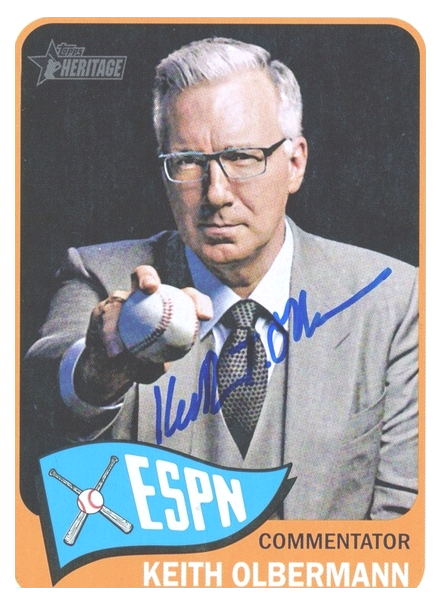 And that's how Topps loses customers... and that's why they're close, but no cigar in this release. I do have a full set of News Flashbacks already, because I'm a minor history buff and I've been building the set since it began being inserted into Heritage. 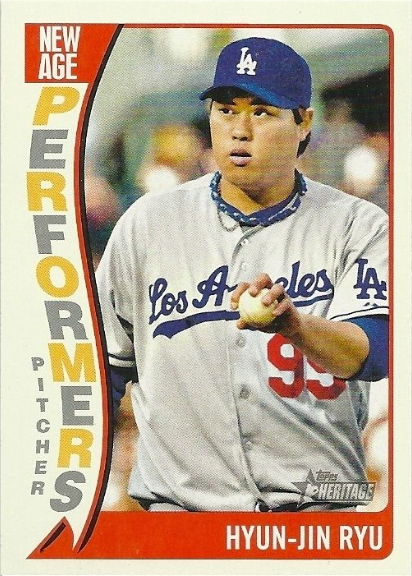 I don't have any actual Heritage cards in my possession yet, though. I hope to find some singles this weekend at one of the local stores (though it's a slim chance). However, if there actually is a lower print run, this year's Heritage set could be highly coveted in the future. Why it pays to look around. A minor find of minor league singles. A Trio of Nagashima Figurines! A big surprise! And a big question mark! More Japanese Cards from America! Stadium Club is Coming Back!